First of all, can I just say...I know this is a book blog, but I'm a HUGE fan of all things vampire, and when I saw that a new movie would be coming out, featuring none other than my favorite bloodsucking creatures, I just had to tell you guys about it! Yay! I know my fiance and I will be some of the first people in theaters to see it. 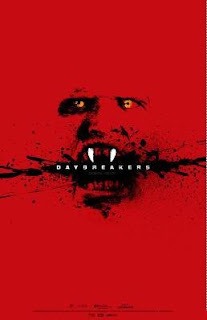 Daybreakers is set to be released on January, 8 2010. Oh my gosh, I'm so excited! I hadn't heard about this either :) Thanks for posting! Oooh, this movie looks so good. Thanks for sharing!